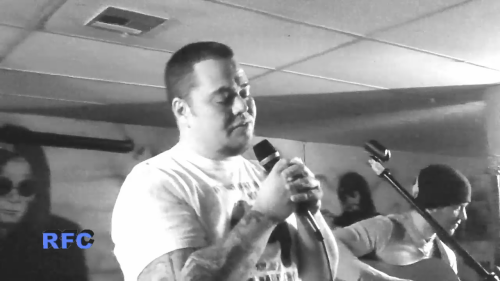 Above you in this blog, you see RFC 153, “Machine of Madness Shirt,” with music from Linework, The Tom McGees and the team of Chad Foss and Sean Sydnor. There;s also a couple of weird short films and some animation, and Lee Harrah is on hand to plug an upcoming all-ages show. Host segments were shot at various points on Charleston’s West Side. Our namesake shirt this week is “Machine of Madness,” by Heartjack. 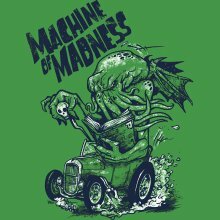 This design is a mash-up of Lovecraft and Big Daddy Roth, with Cthulu tooling around in a Hot Rod. Heartjack is also known as James Mitchell, and he has a graphic novel out that you can find here. 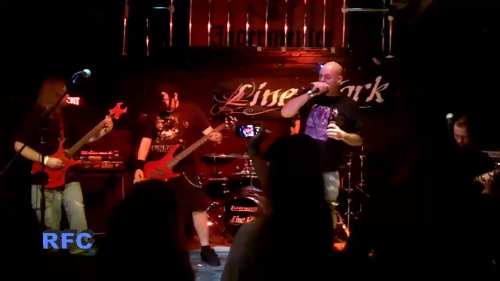 Our first musical guest this week is Linework, a veteran metal band from Charleston that I’ve been following for some time. We filmed them during Mission Coalition last September, but an audio glitch may have doomed the footage to obscurity, until I got the idea to cut a video with that footage and set it to their studio recording, “The Finishers.” You can see the band Friday, March 23, at the Sound Factory, in support of Karma To Burn with Lo Pan and John Lancaster also on the bill. Tickets will be twleve bucks at the door, and the show kicks off at 10 PM. Helping to introduce Linework is Lee Harrah, whose band, HarraH, will be part of the line-up at an all-ages show March 24 at Kanawha Players Theater. Joining HarraH that night will be Remains Unnamed, Relative Obscurity, The Key, Plagued By Disaster and Pure Noxious. That show kicks off at 5 PM, and there will be food provided by Rockin’ Robins. Ten dollars gets you in the door. 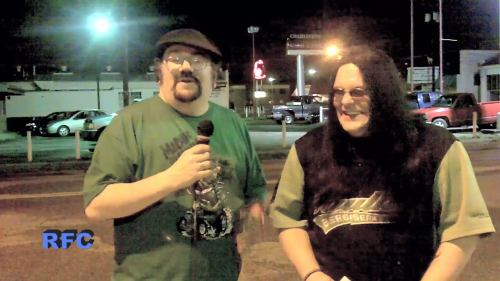 Last week’s show was named “The Tom McGees Shirt,” and this week we actually have The Tom McGees on the show. 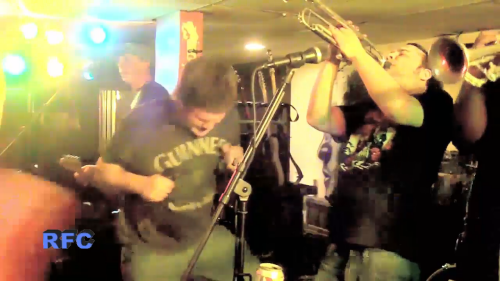 This hot ska band, featuring many veterans of 69 Fingers (as well as three-fourths of the current line-up of RFC faves, The Concept), played to a packed and frantic house at The Blue Parrot last Friday, and we were there to capture it on film. With their song, “The Choice” sit back and enjoy the crunchy goodness of The Tom McGees. Playing us out this week, we go back to a Blue Parrot open mic night from almost a year ago to hear Chad Foss and Sean Sydnor take on WV native Bill Wither’s classic, “Ain’t No Sunshine.” Chad and Sean still turn up at area open mics from time to time, and it’s always a treat to hear them. That’s it for the dirt on this week’s show. 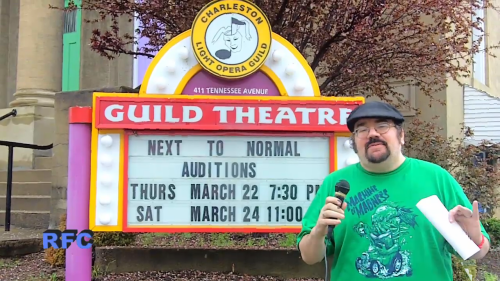 Eagle-eyed viewers may spot the subliminal plug for Auditions for The Charleston Light Opera Guild’s upcoming show, “Next To Normal.” We’re still in weekly mode, so come back in seven days for another blast of local music, art and film.